Make sure you stop by Dana's shop Leilialoo - it's full of wonderful handmade items crafted with lots of heart! 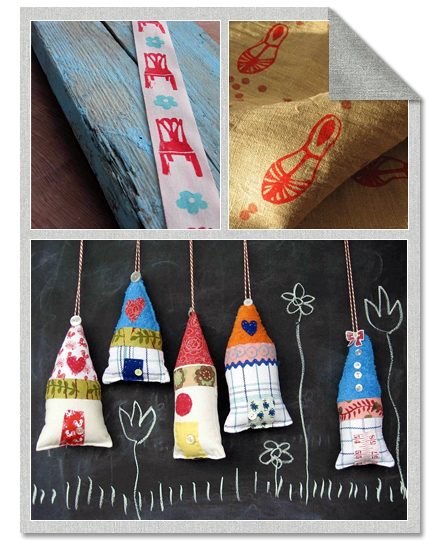 I'm absolutely in love with her hand printed fabrics & ribbons and the sweetest house ornaments. All these wonderful items and much much more can be found in Dana's DaWanda and Etsy shops. And don't forget to stop by her blog leililaloo.blogspot.com to see what else she's got up her sleeve! Lovely! Her fabrics are so sweet and I love all the little houses too! i love that hand printed ribbon! so pretty..thanks for sharing-wonderful pick! What beautiful printed fabric and ribbon! Bonbon Oiseau led me over here and I'm so glad. What a pretty, pretty blog. great work, love her fabric choices! I love those little houses.. they lovely! I love this artist, too, Marichelle!